In his new book, The Net Delusion: The Dark Side of Internet Freedom, Evgeny Morozov aims to prick the bubble of hyper-optimism that surrounds debates about the Internet’s role in advancing human freedom or civic causes. Morozov, a native of Belarus, is a tremendously gifted young cyber-policy scholar affiliated with Stanford University and the New America Foundation. He’s an expert on the interaction of digital technology and democracy and writes frequently on that topic for a variety of respected media outlets. In Net Delusion, as with many of his previous columns and essays, Morozov positions himself the ultimate Net “realist,” aiming to bring a dose of realpolitik to discussions about how much of a difference the Net and digital technologies make to advancing democracy and freedom. His depressing answer: Not much. Indeed, Morozov’s book is one big wet blanket on the theory that “technologies of freedom” can help liberate humanity from the yoke of repressive government. Morozov clearly relishes his skunk at the garden party role, missing few opportunities to belittle those who subscribe to such theories. If you’re one of those who tinted your Twitter avatar green as an expression of solidarity with Iranian “Green Movement” dissidents, Morozov’s view is that, at best, you’re wasting your time and, at worst, you’re aiding and abetting tyrants by engaging in a form of “slacktivism” that has little hope of advancing real regime change. The portrait he paints of technology and democracy is a dismal one in which cyber-utopian ideals of information as liberator are not just rejected but inverted. He regards such “cyber-utopian” dreams as counter-productive, even dangerous, to the advance of democracy and human freedom. Much of the scorn he heaps on the cyber-utopians is well-deserved, although I think there are far fewer of them around than Morozov imagines. Nonetheless, there certainly is a bit too much Pollyanna-ish hyper-optimism at play in debates about the Net’s role in advancing liberation of those peoples who are being subjected to tyrannical rule across the planet. But Morozov simply doesn’t know when to quit. His relentless and highly repetitive critique goes overboard when it veers into all-too familiar territory already plowed by other Internet pessimists and cultural critics beginning back in the 1980s with the late social critic Neil Postman. Indeed, what Postman’s Amusing Ourselves to Death (1985) and Technopoly (1992) were to early discussions about information technology and culture, Morozov’s Net Delusion is to modern debates about the Net and political change. Similarly, Morozov belittles some of the online communities that have formed to support various charitable or civic causes by arguing that if you divide the number of members of such online groups by the aggregate amount of money they raise, it comes out to mere pennies on the dollar per community member. But so what? Do we know if those communities or causes would have come together at all or spent more money without digital communications and networking technologies? It is certainly true that merely setting up a new cyber-cause and giving a few bucks to it isn’t the same as going on a mission to Africa to build homes and water systems, but does Morozov really want to us to believe that more of that sort of thing would happen in the absence of the Net and digital technology? Were African relief charities better off in the days when Sally Struthers lectured us on late-night TV about giving more to such causes? I find that very hard to believe. Regardless, here’s where we can all agree: Technology is just one of many tools that can be harnessed to keep the power of the State in check or advance important civic / charitable causes. I am entirely sympathetic to Morozov’s argument that other factors and forces play an even more important role in promoting democracy and, in particular, ending tyranny. (Personally, I think we’d do more to assist repressed dissidents by sneaking them copies of Guns and Ammo or Soldier of Fortune instead of Wired, but I digress.) “The calculus of measuring quality of life demands a few more steps than simply adding all the efficiencies and subtracting all the inefficiencies,” he says, “it also requires a good understanding of what particular values are important in a particular context of human relations.” (p. 198) Who could disagree with such a statement? The Internet has an important role in increasing information sharing, access to alternative platforms, and allowing new voices to join political debates. The Internet will continue to serve these functions, even with state pushback, as activists devise ways around state online restrictions. Conditions that contribute to success are likely determined not by the given technological tool, but by human skill and facility in using the networks that are being mobilized. … It is less clear how far online organizing and digital communities will be allowed to push states toward drastic political change and greater democratization, especially in states where offline restrictions to civic and political organization are severe. As scholars, we ought to focus our attention on the people involved and their competencies in using digitally-mediated tools to organize themselves and their fellow citizens, whether as flash mobs or through sustained social movements or organizations, rather than the flow of information as such. In other words, we should view information as one of many means to the end and not the end in and of itself. But we also shouldn’t discount its importance too lightly. But What’s the Ultimate Goal Here? There’s a more profound problem with Morozov’s thesis. If he is correct that the Net poses such risks, or undermines the cause of democracy-promotion, isn’t the logical recommendation that flows from it technology control or entertainment repression? If, as Morozov implies, Netizens are spending too much time viewing Lolcats and not enough in the streets protesting or running down to the Peace Corps to sign up for a tour of duty, then what would he have us do about it? Shall we restrict access to the growing abundance of technological / entertainment choices that he laments? Amazingly, he never really clarifies his views on this important point. Like so many other cultural critics before him, Morozov finds it easy to use caustic wit to tear apart inflated arguments and egos on the other side while also conveniently ignoring the logical consequences of their critiques or bothering to set forth a constructive alternative. Reading those passages — especially the words I’ve highlighted — it’s hard not to conclude that Morozov would like to put the information genie back in the bottle. To be clear, he never says that directly since he simply refuses to be nailed down on specifics. But, again, his tone seems to suggest that some form of technological control or information repression may be necessary. I hope that in coming essays Evgeny will be willing to clarify his views on this issue since The Net Delusion leaves us scratching our heads and wondering just how far he would go to counter the supposed “danger” or “threat” posed by digital technology. This is a fair point, and one that is much harder to know how to deal with. But let’s say it is true that social networking tools and other digital technologies which allow greater online personalization and socialization also potentially facilitate increased government surveillance by the State. What are we to do about that? Again, we’re right back at the specter of information / technology repression and, once again, Morozov largely dodges that discussion. (Instead of direct regulation, I would think the better answer would be to educate users about sensible use of those sites or technologies and then work to empower them with more tools to better manage their privacy and/or evade surveillance). Moreover, Morozov once again overplays his hand here. He spends so much time arguing that digital technologies have made our lives more transparent to the State that he underplays the myriad ways it has simultaneously made government activities more visible than at any point in history. It is extraordinarily difficult for even the most repressive of States today to completely bottle up all its secrets and actions. Morozov says modern China, Putin’s Russia and Hugo Chavez are embracing new digital technologies in an attempt to better control them or learn how to use them to better spy on their citizens, and he implies that this is just another way they will dupe the citizenry and seduce them into a slumber so they will avert their eyes and ears to the truth of the repression that surrounds them. Sorry, but once again, I’m not buying it. Repressive regimes really do face a tension when they embrace modern information and communications technologies. It does force them to make certain trade-offs as they look to modernize their economies. Morozov thinks this so-called “dictator’s dilemma” hypothesis is largely bunk, but he seems to expect this process to unfold overnight once new technology moves in. In reality, these things take more time. The general progression of things in most states is toward somewhat greater transparency and openness, even if it does not magically spawn regime change overnight. Importantly, he never really offers a credible cost-benefit analysis of the life of citizens in those regimes today relative to the past. Are we seriously supposed to believe that information-deprived Chinese peasants of the Mao era were somehow better positioned to influence positive regime change than the more empowered modern Chinese citizen? It’s a tough sell. Are their downsides associated with those new technologies (especially the potential for citizen surveillance)? Yes, of course. But let’s not use that as an excuse for marching backwards, technologically-speaking. 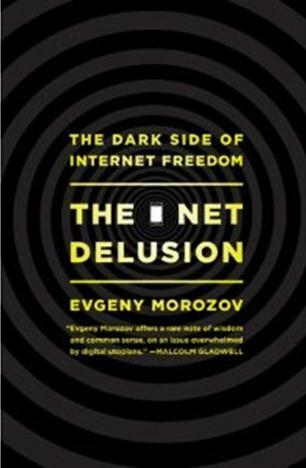 Chapter 8 of the book focuses on what Morozov describes as the “Cultural Contradictions of Internet Freedom.” He again scores some points for rightly pointing to the hypocrisy at play in the United States today — by both government and corporations — when it comes to the promotion of Net freedom globally. He correctly notes that “while American diplomats are preaching the virtues of a free and open Internet abroad, an Internet unburdened by police, court orders, and censorship, their counterparts in domestic law enforcement, security, and military agencies are preaching — and some are already pursing — policies informed by a completely different assessment of those virtues.” (p. 218) Similarly, Morozov castigates many of America’s leading high-tech companies — Facebook, Google, Microsoft, Apple, Twitter, etc. – for preaching the values of Net freedom but then all too willingly handed over information about dissidents to repressive State actors, or playing ball with foreign thugs in other ways. Morozov is right; American leaders in both government and business need to better align their actions with their rhetoric when it comes to the interaction of government and technology. Too often, both groups are guilty of talking a big game about the Internet and freedom, only to later take steps to undermine that cause. As Morozov asks in a recent New York Post column, “Shouldn’t America’s fight for Internet freedom start at home for it to be taken seriously by the rest of the world?” Yes, it should. Thus, on one hand, Morozov laments the fact that U.S. politicians and corporations are far too willing to cave to political pressure, which results in the undermining of online freedoms. On the other, he says that we all need to just chill out and accept the increasing politicization of the Net. He never identifies the potential contradiction in his own thinking here. Will increased meddling will the Net really help advance his cause? I can’t see how but, then again, I’m one of those cyber-libertarians that Morozov would dismiss as unrealistic or “utopian.” Morozov apparently thinks there is some process out there that will help us determine the “acceptable, transparent, and just democratic procedures [for] regulation” yet, once again, he never lets us in on the details. All we know from his book is that the way the past three U.S. presidential administrations have approached Internet policy is not to his liking. And even though it would be hard to call any of them “libertarian” in their approach to Net policy, Morozov clearly thinks the days of “Hands Off the Net” are over and were overrated to begin with. To summarize, Morozov is quite right about the excessive euphoria currently surrounding the relationship of the Net to politics and regime change, but I think he’s gone a bit overboard in The Net Delusion. I realize how much fun playing the role of cranky contrarian must be for him since he’s addressing a target-rich environment, full of irrational Internet exuberance. But Morozov just lays it all on a bit too thick for my taste. “[T]he important thing is to acknowledge that the debate about the Internet’s effects on democracy isn’t over and to avoid behaving as if the jury is already out,” he argues. (p. 241) Fair enough. The problem is, based on the tone of The Net Delusion and some of its conclusions, it appears that Evgeny Morozov has already sent the jury home and rendered a guilty verdict against the Net. The official book site for The Net Delusion. The London Review of Books review of the book + Kirkus Reviews. … and follow Evgeny on Twitter here.